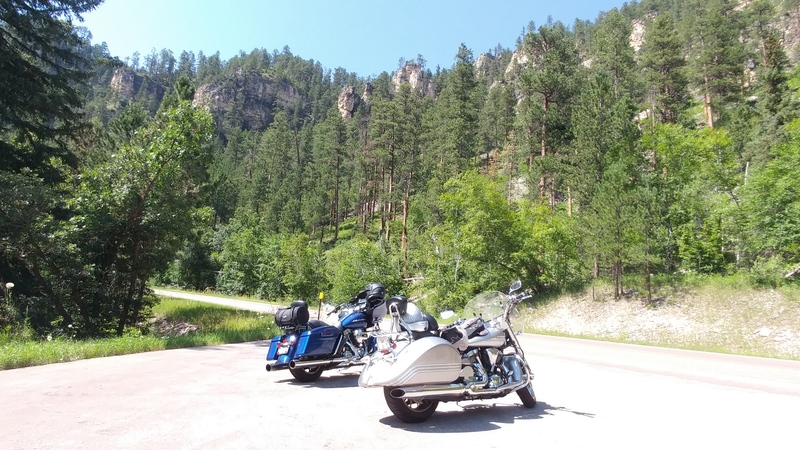 In this 5000+ mile ride one of the big things for Les was to go to Glacier National Park. I agree. Riding the ‘Going To The Sun Road’ is always wonderful, even if you have to follow two or three motorhomes. The downside is not too many Glaciers…Global Warming???? It is a beautiful ride and from there it was on to Kalispell via the Eastern edge of Flathead Lake where years ago I almost bought a place to retire…glad I didn’t because I don’t want to shovel snow. I’ve ridden that road four times now and I never get tired of it. Riding with Les on his first time was a real pleasure and the video of him is wonderful. But my favorite memory of this road was taking my dad on it for his first time. There were a few similarities riding with Les…looking at all the wonders of Glacier Park you forget there is is curve there!!!! Oh crap, I gotta turn here….The smile on Les’ face was priceless. Riding along Flathead Lake was just wonderful, no traffic through the Cherry orchards just a smooth ride and yes, again, there were speeding ticket (going to jail) times…good fun. End of the day was in Kalispell and another great supper.